Whether your dream vacation is boating, water sports, fishing, shopping and dining or reading a book on the shores of a beautiful Northern Minnesota lake you need look no further. This lake home provides the perfect setting for a family or several couples to take in fun filled days, relaxing evenings by the campfire, watching the sunset or dining at one of the area's great restaurants only minutes away. Walk 25 feet down to the dock and enjoy the beautiful sandy bottom beach, perfect for swimming and playing. The house consists of an original red cedar log home with a kitchen, bath, bedroom, great room / dining room and a comfy loft with plenty of seating for relaxed gatherings. An addition was constructed in 2009 adding a full laundry, foyer, master bedroom suite with a gas fireplace and flat screen TV, walk-in shower and 2 guest bedrooms with a Jack and Jill bathroom upstairs. The home accomodates 8 to 10 people very comfortably. You'll find northwoods decor, leather furniture and the ambience and amenities you would expect in first rate 'Up North' home. The location is perfect. A short walk and you are on the trail system. 3 miles from shopping in Walker and only 5 minutes from the area's finest dining at Boulders. You'll find plenty to do in the city of Walker with the historic and beautifully rebuilt hotel Chase on the Lake, Reeds Sporting Goods, area restaurants and specialty shops to appeal to all. The house is uniquely situated only a few feet from the shores of beautiful Kabekona Bay. Access to Walker Bay and Leech Lake is a quick 2 or 3 minute ride East accross the Bay. Don't miss out on an experience you won't forget! The house is only .3 miles from over 100 miles of trails for snow mobiling. Put your fish house (rentals available nearby) out from the cabin on Kabekona Bay where the walleye fishing is waiting for you! The Point Cabin was purchased by our parents in 2000 after more than 15 years of staying at resorts on Leech Lake. Our parents restored the cabin to like-new condition and added on in 2008. Sadly, our mother passed away in 2010 and life took our father in a different direction. In 2018 we (Niki and Monica, along with our husbands, Jamie and Ben) had the opportunity to purchase the family cabin. We look forward to not only our family continuing to make memories in our beloved home, but for your family to make lifelong memories here as well! 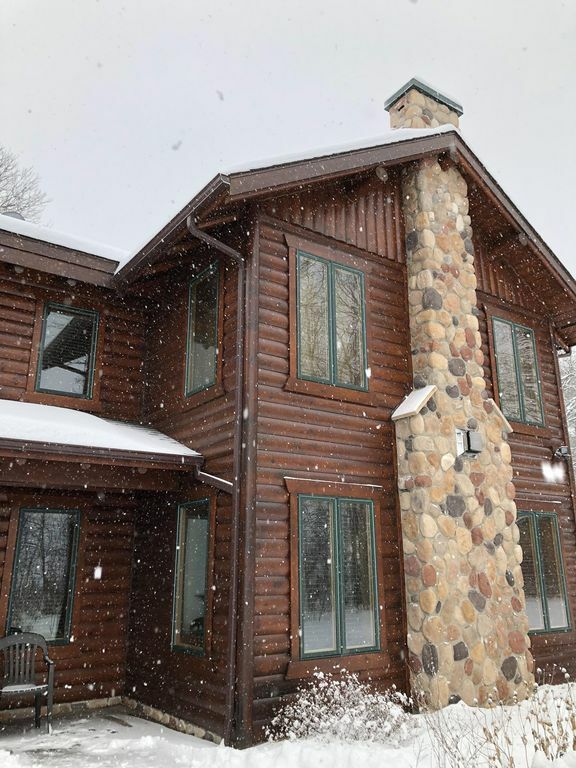 After vacationing in the Walker / Leech Lake area for many years, falling in love with the area and making many friends we decided we wanted to own a property here so that we could spend more time enjoying all that we had come to love. After much looking we chose a charming red cedar log “cabin”. It was a private refuge with a secluded, calm “up-north” feeling. Over the years we remodeled and finally added on in 2008 creating an amazing retreat. Life then took us in a different direction and we didn’t have the time to spend at the lake that we once had. We decided to maintain our family cabin and make it available to others as a remarkable rental property. The Point Cabin, as we call it, is uniquely situated on a small point of Kabekona Bay affording incredible, panoramic views of this beautiful Northern Minnesota lake. You will enjoy a 180 degree view of the bay. A mere 25 feet from the water the cabin provides an intimacy with the lake that few other properties can. Less than 10 steps and you are on the dock. There is also a beautiful lawn to enjoy lawn games, a fire ring for the marshmallow roast or relaxing and telling your favorite Minnesota ghost stories. Cast a line from the dock, take a swim in the sand bottom swim area or read a book in the hammock. A short walk and you can access the area's trail system or rent a boat/jet ski and enjoy fishing or water sports on this protected bay. Prefer shopping or dining? The Point Cabin is located about 3 miles from downtown Walker and even closer to one of the area’s finest restaurants, Boulders (Reservations recommended!). Whatever you decide to do on your vacation, this is the place to do it. Only 25' to the shoreline. Beach is on 2 sides (north and west) of the cabin. Beautiful great room overlooking the lake. Toys for children are located in the foyer closet, as well as games that are stocked in the dining/living area and upstairs loft. Brick paver patio overlooking the lake. Screened In Porch Overlooking the Lake. Outdoor firepit. Bring your own wood. Beautiful cabin and relaxing vacation! Thank you so much for sharing your cabin with us! We enjoyed it very much! We did go ice fishing over on Leach, but didn't catch a dang thing! but that didn't spoil our vacation with great friends! We would definitely come back again!! Nicki was wonderful. The cabin is beautiful, we all loved our time there! Great place to stay in the fall. Great place to stay in the fall. We stayed there for six years and enjoy every year. Great cabin home in beautiful setting! We shared a lovely long weekend between three families, and this pocation and cabin provided a great place for is to reconnect and have fun. We had plenty of room to spread out (we never felt on top of each other), but there are also great spaces for everyone to come together. We were there late in the season, so we were not able to enjoy the dock/lake. Sleeping accommodations worked well for our group. Kitchen is well-stocked, and there is a full size refrigerator/freezer and dishwasher. Bathrooms were clean and roomy; we never ran out of hot water. Laundry facilities on-site would be great for longer stays. There are televisions in the main living space and all bedrooms, but we never turned them on. Walker is very close with a large grocery store. Overall, we really enjoyed our stay and would definitely book another stay in the future. Rates are subject to change until reservation is confirmed. Stays of 30 days or longer are exempt from sales tax. Additional refundable damage deposit may be required for special events. 30day notice is required on cancellations to receive full refund.